Microsoft plans to acquire Nokia’s Devices & Services business in a deal valued at EUR 5.44 billion (US$7.1 billion) in cash. The deal includes all of the Mobile Phones and Smart Devices business units as well as Nokia's design team, operations including all Nokia Devices & Services production facilities, Devices & Services-related sales and marketing activities, and related support functions. At closing, approximately 32,000 people are expected to transfer to Microsoft, including approximately 4,700 people in Finland. Following the sale, Nokia plans to focus on its NSN, HERE (mapping and location services) and Advanced Technologies (R&D and patent licensing) businesses. Nokia's CTO (Chief Technology Office) organization and patent portfolio will remain within the Nokia Group. Nokia will grant Microsoft a 10 year non-exclusive license to its patents as of the time of the closing. 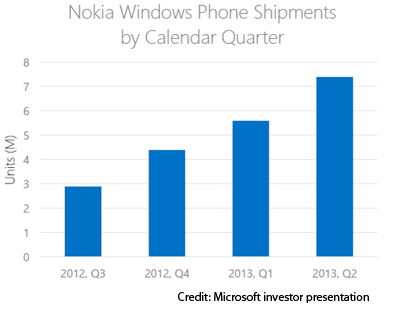 This includes over 8,500 design patents relevant to the hundreds of Nokia handset models. Microsoft will grant Nokia reciprocal rights related to HERE services. 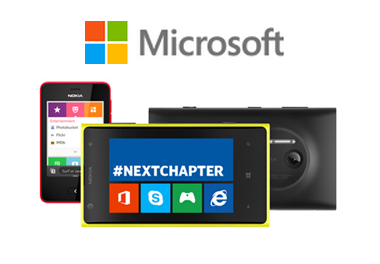 Nokia will grant Microsoft an option to extend this mutual patent agreement to perpetuity. Microsoft has agreed to make immediately available to Nokia EUR 1.5 billion of financing in the form of three EUR 500 million tranches of convertible bonds to be issued by Nokia maturing in 5, 6 and 7 years respectively. Microsoft has agreed to a 10 year license arrangement with Nokia to use the Nokia brand on current Mobile Phones products. To avoid the perception of any potential conflict of interest between now and the pending closure of the transaction, Stephen Elop will step aside as President and CEO of Nokia Corporation, resign from the Board of Directors, and will become Executive Vice President, Devices & Services. Risto Siilasmaa will assume an interim CEO role for Nokia while continuing to serve in his role as Chairman of the Nokia Board of Directors. He will oversee strategy and have four direct reports: Michael Halbherr, Executive Vice President, HERE; Stephen Elop, Executive Vice President, Devices & Services; Timo Ihamuotila, Nokia CFO and interim President; and Jesper Ovesen, Executive Chairman of the NSN Board of Directors. "After a thorough assessment of how to maximize shareholder value, including consideration of a variety of alternatives, we believe this transaction is the best path forward for Nokia and its shareholders," said Risto Siilasmaa, Chairman of the Nokia Board of Directors and, following today's announcement, also Nokia interim CEO. Microsoft said having "one brand, one united voice" for Windows Phone will help its marketing efforts. The companies believe they can get the deal completed by early 2014. Verizon Communications and Vodafone Group Plc reached a deal under which Verizon will acquire Vodafone’s 45% equity stake in Verizon Wireless for $130 billion. This will give Verizon full ownership of Verizon Wireless. Lowell McAdam, Verizon chairman and CEO, said: "Over the past 13 years, Verizon Wireless has been a key driver of our business strategy, and through our partnership with Vodafone, we have made Verizon Wireless into the premier wireless provider in the U.S. The capabilities to wirelessly stream video and broadband in 4G LTE complement our other assets in fiber, global IP and cloud. These assets position us for the rapidly increasing customer demand for video, machine to machine and big data. We are confident of further growth in wireless, and our business in its entirety." Vittorio Colao, Vodafone Group CEO, said: "This transaction allows both Vodafone and Verizon to execute on their long-term strategic objectives. Our two companies have had a long and successful partnership and have grown Verizon Wireless into a market leader with great momentum. We wish Lowell and the Verizon team continuing success over the years ahead." The deal will require regulatory approvals and the approval of both companies’ shareholders. The company expect the transaction to close in the first quarter of 2014. Under the deal, Verizon will pay Vodafone $58.9 billion in cash, which it will obtain through a fully executed bridge load from J.P. Morgan Chase Bank, Morgan Stanley Senior Funding, Bank of America, N.A. and Barclays. Verizon will also issue common stock currently valued at approximately $60.2 billion to be distributed to Vodafone shareholders, subject to a collar arrangement with a floor price of $47.00 and a cap price of $51.00 that will determine the maximum and minimum number of shares to be issued upon closing of the transaction. In addition, Verizon will issue $5.0 billion in notes payable to Vodafone, and Verizon will sell its 23.1 percent minority stake in Vodafone Omnitel N.V. to Vodafone for $3.5 billion. The remaining $2.5 billion of the transaction value will be a combination of other consideration. Ericsson plans to build and operate three, huge data centers to serve as platforms for customer innovation and its own R&D. Together, the three facilities will measure 120,000 square meters (1.3 million square feet), approximately the size of 14 football fields. Two of the new data centers will be in Sweden (Stockholm and Linköping), while the third one will be built in Montreal, Quebec, Canada. The company expects that innovative design will reduce energy consumption by 40% compared to typical data centers. The two ICT Centers in Sweden will begin initial operations from end of 2013 and from end of 2014 respectively and the North American ICT Center from early 2015. Ericsson is planning to invest SEK 7 billion (US$1.06 billion) in the project over a period of five years..
Ericsson said customers will be able to connect remotely to the new facilities for interoperability testing and trials of new business services. The new centers will house the company's complete portfolio, enabling the R&D organization to develop and verify solutions, creating the foundation for the next generation technology and cloud-based services. "The new ICT Centers are examples of Ericsson's passion for driving the development of the industry. Great ideas come from collaboration, and at these centers we will push the boundaries of possibility on next generation technology and services. Flexibility enabled by new ways of working will realize innovation faster to the market and to our customers," said Hans Vestberg, President and CEO, Ericsson. Pure Storage, a start-up based in Mountain View, California, last week announced $150 million in new funding to support its all-flash enterprise storage array strategy. The Series E funding round was led by T. Rowe Price, Tiger Global Management and other public market investors, with participation by its previous venture capital investors Greylock Partners, Index Ventures, Redpoint Ventures, Samsung Ventures and Sutter Hill Ventures. This bring Pure Software's total capital raised to date to $245 million. The company said it is on-track for a future initial public offering (IPO). Pure Storage offers all-flash enterprise arrays for high performance workloads, including server virtualization, desktop virtualization (VDI), database (OLTP, real-time analytics) and cloud computing. The company's approach combines proprietary data deduplication and compression technologies with affordable multi-level cell (MLC) flash memory. The company says that since releasing its flagship FlashArray to general availability (GA) in 2012 it has achieved over 50-percent consecutive quarterly growth. NEC Neva Communications Systems will supply its LTE microcell base stations to Russian mobile operator Scartel (Yota). The first installations have begun operating in Scartel's LTE network across major cities, including Moscow, Saint Petersburg, Krasnodar and Sochi. NEC said its LTE microcell base stations provide the ability for multiple operators to provide services simultaneosly. NEC's LTE base stations are also equipped with a Heterogeneous Network (HetNet) capabilities, enabling base stations with different radii of coverage to work in unison. The units also support Self-Organizing Network (SON) functionality for facilitating the coexistence of products manufactured by multiple vendors within the same network. Raymond Armes, Managing Director of NEC Neva, underlined the effectiveness of NEC's solution: "Our microcell base stations have demonstrated excellent results in terms of automation and energy saving, which consequently helps operators using our technology to reduce both CAPEX and OPEX. This latest partnership will enable us to expand our contributions to Scartel's network." 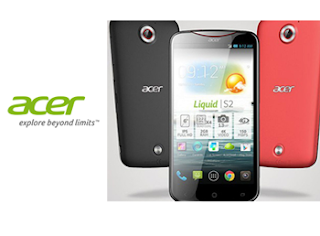 Acer unveiled the first smartphone featuring 4K Ultra HD recording capability, which is driven by Qualcomm's new Snapdragon 800 processor. Users will need a 4K TV to benefit from the higher resolution as the Acer Liquid S2 offers a 6-inch IPS display with 1080 resolution. LTE is supported at up to 150 Mbps. It also features the new 802.11ac Wi-Fi. A Zero Air Gap Display removes the air between the touch panel and LCD module, thereby providing improved tactile sense and reduced reflection boosting readability even in sunlight.